This afternoon I had a few minutes spare to make some Lavender Meringues (see recipe in my post of the 7th May). The flowers are particularly good this year but I might have been a little over zealous adding 4 flower heads as they are a little strong – but perfect for sandwiching together with cream! 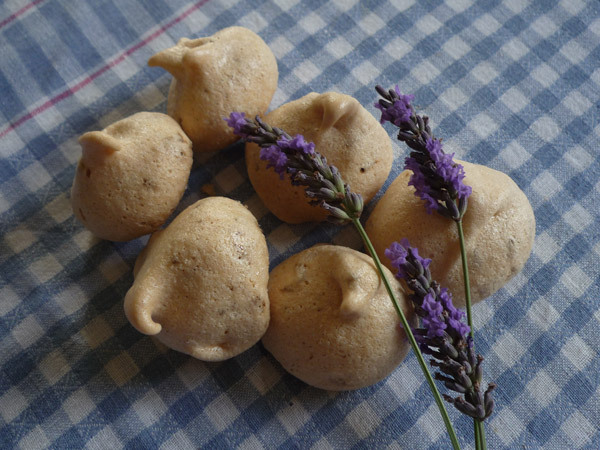 Lavender Meringues are light as a feather and nice things to serve with coffee after a meal. These have turned out a bit brown but others I have made have had a more mauve colour as you’d expect from lavender. Perhaps it depends on the age of the flowers. Delicious whatever the colour. Wandering around the garden this afternoon it occurred to me that food possibilities are shortly going to get rather exciting. If we were in Provence (sadly, we are not), we would already be enjoying the first courgettes, broad beans and maybe some fresh chard. But things are looking up. We’re already enjoying some of the best and most flavoursome strawberries which are ripening so quickly I have to pick 2 or 3 times a day.And the vegetables are progressing despite being in desperate need of some rain with that magic ingredient that tap water just can’t provide. But it’s also worth looking to the flower garden for culinary inspiration. I love to brighten salads with nasturtium flowers and their peppery leaves. I’ve planted small pockets of them all over the garden and one or two in a herb planter next to the front door. A couple of years ago I found a recipe that uses lavender flowers in meringue which make a delicious light dessert or an alternative sweet to serve with coffee at the end of a meal. They’re very easy to make though don’t be too heavy-handed with the lavender as it can be overpowering. Turn on the oven and heat to 150C. Take three of four lavender flowers, remove the stalk and grind them in a pestle and mortar to release the flavour and break them up. Whisk one egg-white until stiff. Whisk in 50g caster sugar a bit at a time. Gently fold in the lavender. You may not need it all. Use a teaspoon to make small meringues on a baking sheet covered with greaseproof paper. Turn the oven down to 140C, put the meringues in and leave them to cook for 1 hour. Turn off the oven and leave the meringues in there until cool. The delicate mauve colour and refreshing summery taste will surprise you.